Flying is easy. Aeronautical decision-making is the challenge. Sometimes flying safety depends solely on your skill with the physical tasks of manipulating the controls. But most of the time it’s the decisions you make, including the decision whether to attempt a take-off or landing at all, that determine the safe outcome of a flight. The ability to combine the two components of a safe flight—pilot judgment plus stick and rudder skills—is what makes the best pilots. And yet, just as your total flying time and recency of experience influence your ability to perform skills like maintaining precisely level flight or excelling with crosswind landings, so too is your judgment actually a variable, increasing (and sometimes decreasing) based, ironically, on your ability to evaluate your own level of knowledge. I was fortunate to attend the National Business Aviation Association (NBAA) convention in Orlando, Florida in mid-October. NBAA is the premier advocate for the use of aircraft in the furtherance of business around the globe. A major focus of NBAA is flying safety. In recent years NBAA has greatly expanded its focus on the safety of business aircraft flown by a single pilot. The annual Single-Pilot Safety Stand-Down (SPSS) is a day-long series of seminars held just before the official opening of the NBAA convention. The lessons of the SPSS are equally valid for the recreational pilot of a Piper Archer or a Beechcraft Bonanza and the career pilot flying a Pilatus PC-12 or a Citation Mustang. No matter what you fly, it applies to you. The first SPSS speaker was Alan Gorthy, a retired US Navy fighter/attack pilot and past commander of the Navy’s Aggressor Squadron. He is now an assistant manager for runway safety for America’s Federal Aviation Administration. With a full military career served in high-workload, single-pilot jet aircraft, Gorthy has considerable experience contemplating and strategising on the demands of pilot judgment. As a result, he has developed a theory about single-pilot decision-making he calls the Four Levels of Competency. I’ll list Gorthy’s four levels, and comment on each based on my experience and my impressions of what I learned at the SPSS. This is the pilot who knows ‘just enough to be dangerous’. They meet minimum standards for pilot certification and ratings, but these pilots have not actively worked to go beyond the bare minimums, or to grow within the practice of flight—a profession we all practice, regardless of whether we are paid to fly. These pilots know there are limits to their knowledge and capability, and at least should be actively working to fill the gaps and expand within the practice of flight. These pilots will set conservative personal limitations and (hopefully) have the discipline to fly within those limitations regardless of temptations and pressures. These pilots have filled many of the knowledge and skill gaps, and worked to retain skills—they are confident that they could pass today if given a no-notice checkride for the certificates and ratings they hold. Level 3 pilots will adhere to personal limitations—by knowing what they know, the Level 3 pilots are more capable of intelligently creating personal limitations. These pilots actively seek new and challenging training opportunities and read voraciously on the topic of being a better pilot. These pilots are at the top of their game, and are ready for anything the aircraft, the environment or the operation can throw at them. Being ‘in the zone’ as a pilot is a matter of currency, recency and practice—in normal, abnormal and emergency procedures—as much as it is knowledge and past experience. Let’s look more closely at examples of behavior at each level of competency, and how each can have positive and negative outcomes for pilots and the people with whom they fly. Research shows that the rate of accidents goes down noticeably after a pilot has logged 100 total flying hours, and also when they have at least 100 hours on the specific make and model of airplane being flown. But mishap experience also shows that the rate of accident reverses trend and increases once that same pilot has more than about 250 total time and/or 250 hours in make and model, before decreasing again a few hundred hours later. Why might that be? Indications are that complacency is the culprit. In their own frame of reference these pilots think they have a lot of experience, when in fact they don’t. They believe they know everything they need to know, and may feel like they’re flying on Level 4 (back to that later). But the reality is they probably just have not been faced with a situation requiring a good judgment call … just yet. And it seems that if they fly long enough—they add a couple hundred additional hours in their logbook—they figure out that there’s more to this flying thing to be learned, and ratchet down their risk tolerance. Usually it takes getting scared in the aircraft to realise there’s need to improve. But if you feel you haven’t learned something new and useful in the past six months from some dual instruction or flying a simulator, or from a seminar or an article or video, at least in some ways you either never progressed from Level 1, or you’ve allowed yourself to slip back into a Level 1 mentality. Realising this—and acting on it—instantly moves you to Level 2. Level 2 is the pilot who identifies one or more gaps in their knowledge. Are you a little fuzzy about the recent changes in the pilot regulations? Can you explain, in simple terms, why thunderstorms build along the Great Dividing Range in the afternoons, and how to anticipate whether storms will affect your flight? Are you well versed in engine management and mixture control technique? Are you a master of your GPS’ modes and functions? There are a thousand questions, and no one can know it all. The Level 2 pilot will admit they can improve as a pilot. More so, the Level 2 pilot will actively seek new things to learn, then find a way to learn them. 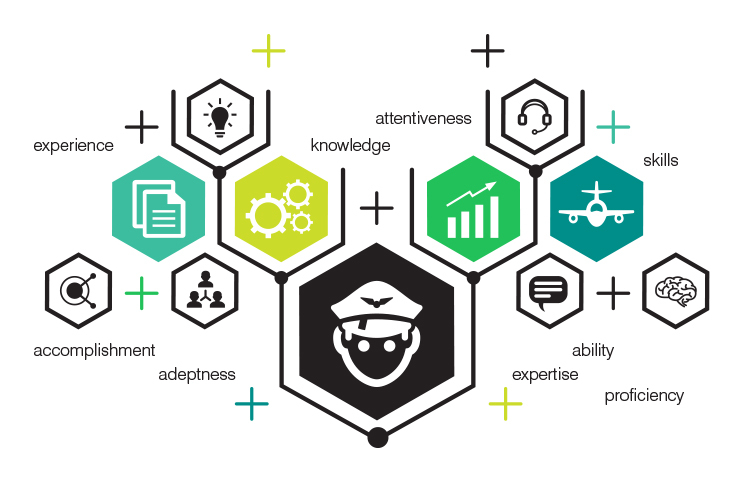 The apex of the four-level competency model is the pilot who can instantly combine the right combination of physical flying skills with superior judgment. More importantly, the Level 4 pilot will use his or her superior judgment, as the saying goes, to avoid situations requiring demonstration of superior flying skills. The hazard, of course, is that flying as a Level 4 natural and being a Level 1 thinking you know everything feel a lot alike. Just as there’s a spike in reported accidents after about 250 hours, there’s another increase for the pilot with over 1500 total flying hours. As it turns out, there’s always something new to learn, and a continual need to review and practice the basics no matter how much you’ve flown. The best pilots will drift between Levels 3 and 4 depending on how frequently they’ve recently flown, says Gorthy. You can only be ‘in the zone’ when you are comfortable and current enough with flying that you don’t have to think about the physical flying tasks, so you can almost subconsciously control the aircraft while freeing your mind for the higher-level judgment tasks. I submit that the very best pilots are Level 3-dominant, meaning they have learned a great deal about safe flying and decision-making beyond the minimum required for pilot certification, and they employ well-reasoned limits on the risks they will accept based on their knowledge and experience. But in many ways they remain in Level 2 all their lives, actively seeking new skills and knowledge—becoming better Level 3 pilots in the process. And if they are able to fly frequently enough to exercise both their physical flying and their aeronautical judgment skills, they feel and act like a natural—a Level 4 pilot in reality, not just in the pilot’s mind. Sadly, the culture of flying often idolises the pilot who ‘knows it all’ and ‘can fly anything with wings’ when in fact such a pilot is often on the lowest level of Gorthy’s scale of judgment. US General ‘Chuck’ Yeager famously wrote that, ‘There’s no such thing as a natural-born pilot.’ You’ve got to work hard to make it look easy. It’s our goal as pilots higher up on the competency scale to serve as examples and mentors to the level ones out there, so they want to advance in their personal competency as well. Thomas P. Turner is a pilot, master CFI, writer and lecturer based in Wichita, Kansas.